Are you planning a seaside holiday in Malia? 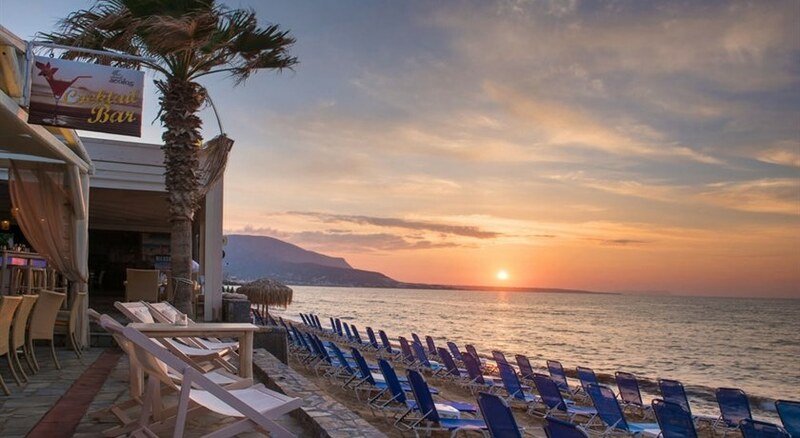 Check out Aeolos Beach Resort Hotel to enjoy friendly ambiance and proximity to the beach, recreational centre, restaurant, cafes, supermarket and other popular destinations. It offers half-board accommodation. Guestrooms in Aeolos Beach Hotel Resort are divided into Single, Double, Triple and Family rooms. Accommodations come fitted with either double bed or twin beds, but some common features are TV with satellite, air conditioning, en suite bathroom, fridge, safe deposit box, telephone, and WiFi internet. Also, each room has a private balcony that offers a mesmerizing view of the sea and the surrounding. The Tavern restaurant serves breakfast (7:30am to 9:30am) and dinner (7pm to 9pm) in buffet style and a la carte menu at lunch. The spread and the menu present authentic Cretan and European cuisines. It also serves cakes, desserts, ice creams, tea, coffee, tea, soft drinks, wine, beer and other alcoholic drinks—but drinks might not be included in the half-board boarding option. During daytime you can head to Aeolos Beach Snack Bar or the Poolside Bar where an array of cocktails and mocktails along with snacks and light meals menus are served—they open between 9:30am and 8:30pm. The hotel features two outdoor swimming pools with solarium, sun beds and umbrellas. Located amidst a large beautiful garden, guests of any age can play various activities—some popular recreational facilities in the premises are darts, table tennis, aqua aerobics and etc. In case you need any help in navigating around, there is a travel desk. Just to mention a few thrilling sports and activities off the hotel complex, you’ll find are tennis, horse riding, golfing, hiking, biking, jeep safari, jet ski, water ski, parasailing, banana ride and speedy ringos and more. Animation and entertainments are also held regularly and in the evening the hotel broadcasts live sports and events in the giant screen.